Peril at End House By Agatha Christie Review! I’m currently taking part in the Agatha Christie Readathon by James J. Cudney from the blog This Is My Truth Now. 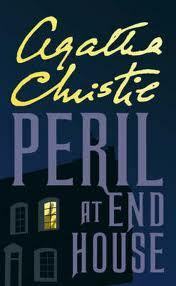 Peril at End House (1932) by Agatha Christie is the eighth Christie book in which Hercule Poirot features. Narrated by Captain Arthur Hastings, the book also features Inspector Japp of Scotland Yard. The setting for the book is the fictional seaside town of St Loo in Cornwall where Poirot and Hastings are on vacation. Poirot is enjoying his retirement but his retirement is soon a distant memory when he and Hastings meet a young woman called Magdala “Nick” Buckley. Poirot becomes convinced that someone is trying to kill their new friend and his thoughts are further intensified when he finds a bullet which Nick had thought was a wasp shooting past her head when they first meet her. It soon becomes apparent that Nick has been the the victim of numerous strange incidents of late. Then Nick’s cousin Maggie is killed while she is wearing Nick’s shawl. That was a sad moment for me because I really liked Maggie and she wasn’t in it for very long! So now Poirot and Hastings are really on a case full of secrets, lies and deceit. But there’s a stumbling block throwing our dynamic duo into chaos and confusion. End House is a house which needs to have many repairs and is mortgaged. But Poirot and Hastings plug on with determination and they have many suspects to look into. There’s Nick’s friend Frederica who is known as Freddie, Nick’s cousin Charles who inherits End House if Nick dies, Ellen the housekeeper at End House and the Australian couple the Crofts who are renting the house from Nick. It is an intriguing book with an excellent twist at the end. I did get the twist, probably because I write mysteries, but like even when the Agatha Christies where a reader gets who the killer/s is, the intricacy of how and why are totally on point. A wonderfully crafted story by our writing legend.